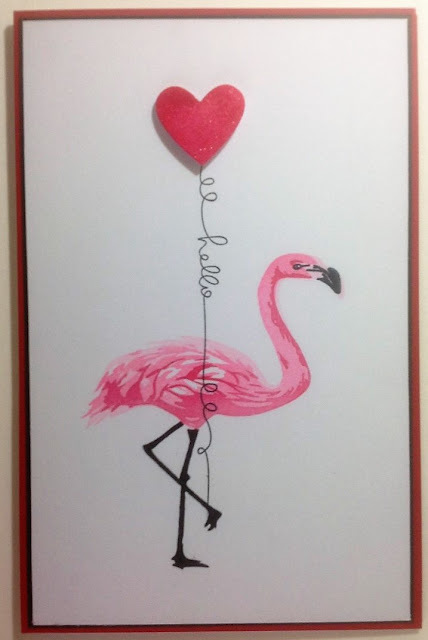 I really enjoyed using this layered stamp set from Hero Arts to create the flamingo, and will definitely be making more flamingo-themed cards. There are some brilliant sentiments in the set, but this time I wanted my flamingo to be holding a balloon, and I thought it would be fun to use this string word stamp instead. To make the balloon, I die cut a heart from scrap white card, coloured it with one of the inks I'd used to stamp the image and finished it with a touch of sparkle from my clear Wink of Stella pen. There are some gorgeous examples made by the DT to inspire you - pop over to Daring Cardmakers to check them out and you can also link up to share your own creations. A boy, this is such a fun card. Love the string with hello and the flamingo is fabbo! Loving your fabulous flamingo. Thanks for joining in at Daring Cardmakers.